Most video doorbells on the market give you the same basic features—two-way audio for talking to people at your door, motion detection and alerts that notify you if someone is at your home, and video footage that lets you keep an eye on packages if you aren’t home to take them inside. The SkyBell doorbell camera offers all these standard features, but it can also connect to your security system and other devices in your home. 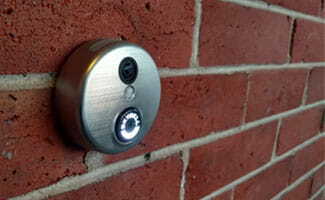 This means you can use the SkyBell for more than monitoring your front door. If you’re looking for a doorbell camera that cooperates with other smart devices and pairs with an alarm system, it may be the right option for you. Summary : We’re pleased with the SkyBell’s compatibility with other devices and affordable price. We’re also happy with the quality of the audio and video. However, SkyBell’s rocky customer service reputation and wireless limitations are real drawbacks. We’d still recommend it if you want a doorbell camera that integrates with your security system and works with smart home devices, but we hope SkyBell improves customer support and adds some more capability in the future. How much does SkyBell cost? Although SkyBell is compatible with many security systems, it isn’t automatically included with most packages. You’ll need to purchase it separately or as an add-on through your security company. SkyBell retails at $199 (view on the SkyBell website), which is pretty reasonable for all the capability it offers. You can pair it with your security system or use it alone as a very basic DIY security measure. At $199, it is the same price as the August doorbell camera and about $50 less expensive than the Ring Pro. SkyBell can often be found on Amazon at a lower price. Size: 2.8 in. width, 0.9 in. depth, 1.9 oz. What sets SkyBell apart from other doorbell cameras? Like most other video doorbells on the market, SkyBell HD offers motion detection and two-way audio so you can get alerts if someone comes to your door and communicate with them even if you’re away. It’s nice to know when packages have been dropped off and who has been to your door, and we’re happy with the quality of both video and audio. Color night vision. This feature makes it easier to see what is happening outside your door, even in low light. Quiet mode. Using this setting means that SkyBell will notify your phone when someone pushes the button instead setting off the chime—a feature that should particularly appeal to parents with napping toddlers. Free cloud storage. You have access to footage from your video doorbell for seven days after it has been recorded. This should be plenty of time to review your recordings and save any that you want to keep long term. Competitors like Ring charge a monthly fee for a similar service. Durability. SkyBell HD can withstand more extreme temperatures than other smart doorbells. For example, some people have had trouble getting the Ring Pro doorbell to work in very cold weather, but the SkyBell can operate in temperatures between -40°F and 140°F, so it may be a better option if you live in an area with intense winters. Compatibility with smart home devices. SkyBell works with many other smart devices, which makes it a good option for customers who want a more connected home. Integration with security systems. If you’re looking for a video doorbell that will cooperate with a home security system, SkyBell is an excellent choice. SkyBell’s video doorbell is now compatible with IFTTT, Nest, Amazon Echo, Honeywell, and Samsung SmartThings, along with a number of other smart home devices. Because it is compatible with so many other devices, you can tell SkyBell to turn red if your Nest Protect detects smoke or CO, or connect your smart lock and have SkyBell take a photo whenever your door is unlocked. Plus, if SkyBell’s motion sensor is triggered, you can have your smart lights automatically turn on and tell your smart lock to automatically lock your door. SkyBell is also compatible with many home security systems. In fact, many of the companies we include in our best home security system rankings have recently added SkyBell compatibility. You can now use SkyBell with Brinks, Link Interactive, and Frontpoint. Pairing your video doorbell with your alarm system gives you some extra security at your front door. For example, you can have SkyBell start recording video if an alarm in your system goes off, or have your security system arm if the motion sensor on your SkyBell is triggered. Improved control over notifications. We’ve noticed that SkyBell sends a lot of notifications—many of them non-essential. We’d like more control over notification settings in the future so individuals can customize settings to suit their preferences. Multiple user accounts. At the moment, you can have only one login, so you have to share your account details with anyone else in your home who wants to use the SkyBell app. Support for wireless chimes and intercoms. SkyBell works only with wired doorbell chimes. Offering wireless support would make installation easier for many users and give them more options for connecting the doorbell throughout their home. 5 GHz capability. SkyBell works only on a 2.4 GHz connection. This isn’t a huge problem, but adding 5 GHz support would give some customers better Wi-Fi options. For instance, in some cases, you might have better bandwidth on the 5 GHz channel. Better customer support. We came across a lot of complaints about customer service in our research. In particular, people have been frustrated because you can reach customer support only during limited window of time (Mon.–Fri. 7:30 a.m. to 4:30 p.m. PST and Sat. 8:00 a.m. to 2:00 p.m.). If you need help with your doorbell on a Sunday or after business hours, there aren’t a lot of options, and SkyBell does not currently offer callback support. We’d love to see online chat support and extended customer service call center hours. Faster response from the motion sensor. 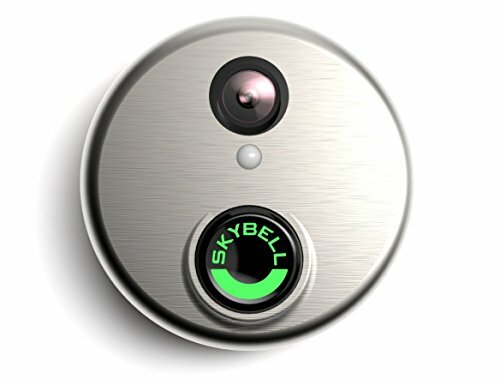 Right now, SkyBell will activate when someone has been at your door for more than 10 seconds. This means that someone who stops by and quickly drops something on your doorstep and then leaves may not trigger the sensor. In most cases, customers have a pretty easy time installing and setting up the SkyBell, but there are a few things you should check before purchasing it. Make sure your chime is compatible. SkyBell will work only with wired chimes. These chimes can be mechanical or digital as long as they can be wired to your doorbell. If you have a digital chime, you’ll need a separate adapter. Check your Wi-Fi speed outside your door. You’ll need at least 1.5 Mbps of upload speed for the doorbell to work. Check the power at your doorbell. Your transformer needs to provide 10–36 VAC (volts alternating current) for the doorbell to work correctly. For more details about installation, check the power diagrams on SkyBell’s site. Failure to follow instructions can damage your doorbell and void your warranty, so it is important to hook it up correctly. Make sure your router is set up on the 2.4 GHz channel. SkyBell is not compatible with the 5 GHz band. For more details about these issues, read through SkyBell’s Pre-Installation Checklist. In most cases, customers writing reviews found installation relatively painless, and they were happy with the features of SkyBell’s doorbell camera. Many of the negative reviews focused on poor customer service. Super easy set up for me. I like being able to turn off the inside door chime when my child naps. The video captured also picks up about 3-5 secs as a person approaches to ring it. Even without the motion detector on. So all my recordings are of faces and not delayed shots of someone’s back like my friend’s Ring brand. Lots of bogus reviews out there where I almost didn’t get this. Glad I tried it for myself. I haven’t had to deal with customer service yet so I’ll update if there’s any issues there. Do we recommend the SkyBell video doorbell? SkyBell HD comes with lots of features and quality hardware. While we’re not sure it is the very best doorbell camera on the market, it is one of the best—and it may be the right choice if you want a smart doorbell that cooperates with other devices and pairs with your security system. What features are you looking for in a doorbell camera? Share your thoughts in the comments below.